Regular readers of this blog know about my affinity for thrift stores and general love of crafting with things that people consider disposable. On my most recent trip to a secondhand charity shop, I came across rolls upon rolls of old wallpaper. Most of them were partial rolls, presumably what remained after various redecorating projects (undertaken mostly in the 1980s judging by the prints). I selected a very reasonably priced (39 cents!) roll of mottled bluish-gray paper, convinced that it would be perfect for . . . er, something. I eventually decided to make envelopes with the beautiful, heavy paper. When I make cards at home, I always need extra envelopes and I thought the wallpaper would make the perfect unique packaging. I started with commercial card envelopes in two sizes, one greeting card-sized, one note card-sized. I carefully pulled the envelopes apart along the seams. I used them as templates, tracing around the edges as precisely as possible. I cut my new envelopes out of the wallpaper, then used a straightedge to crease the flaps. Then I used rubber cement to adhere the edges of the bottom flap and two side flaps (side flaps folded in first, then the bottom flap on top). I carefully covered both surfaces in rubber cement and let it dry for a minute until tacky. This will ensure a permanent bond when the surfaces are brought into contact. Pretty easy, right? I noticed while making the envelopes that the wallpaper I bought was very soft, almost fabric-like. I thought it could be sewn, so I decided to make greeting cards with the wallpaper that incorporated stitching. 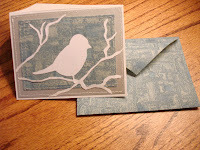 I sketched a simple design of branches and a bird on white cardstock, then carefully cut it out. I used the same white cardstock as the base of the notecard. I cut a rectangle of heavy, silver cardstock for the front of the card. Then I cut a slightly smaller rectangle from the wallpaper. I centered the wallpaper on the silver rectangle, leaving a border around the edges. Then, using my sewing machine, I stitched the two layers together. I used spray adhesive to attach my cutouts to the card front. 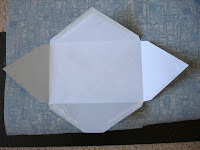 Then, I sewed the silver rectangle to the white cardstock base. The photo below shows the stitching, although I know it is a little blurry. I am really happy with the way the card turned out; I've never sewn paper before and my machine stitched through it beautifully (thanks to my Grandpa for the sewing machine tune-up!). The wallpaper was the perfect material for my envelopes and cards. Next time you are at a rummage sale or thrift store, keep an eye out for unique wallpaper. 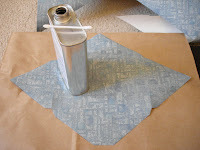 It could be used to make mini envelopes for gift cards, bookmarks, origami boxes. Maybe gift tags? I'm sure you'll come up with even more creative things to do with this versatile material. Be creative and enjoy! I too make them. I just started about a year ago doing them. I tried the glue thing and didn't like it because of the oder. Just this morning I read another blog where the lady used a white trash liner and a hot iron to fuse the wall paper and a backing so the printing could not be seen on the back of the wall paper. 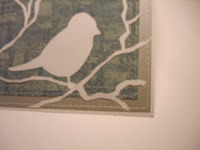 I am going to try that method on the cards, fusing the cardstock to the wall paper and see how that works out. Also, I found that the double sided tape for scrapbooking works for putting the envelope together very nicely. I just thought I would share this with you. Perhaps I'll give the rubber glue another try on the envelopes again because the double sided tape gets expensive. You card is beautiful! Gift Card envelopes look so simple and classic..thanks for sharing.